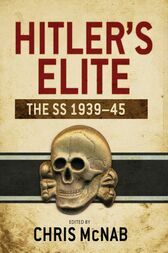 Hitler's Elite: The SS 1939–45 tells the complete story of the SS at individual, unit and organizational levels. Following an explanation of the SS' complex political and social origins, and its growth within the Nazi empire, it goes on to look at both its war record and its wider role in Heinrich Himmler's implementation of Hitler's vision for the Third Reich. As well as providing a combat history of the Waffen-SS from 1939 to 1945, it also explores themes such as ideology, recruitment, foreign SS personnel, training and equipment. The book's textual history is brought to life with more than 200 photographs and colour artworks from Osprey's series titles. As a companion volume to Hitler's Armies and Hitler's Eagles, this book gives a detailed and highly visual insight into one of Hitler's most powerful instruments of policy.